Do you Run in PAIN? Do You Want to Run Faster? Longer? More Efficient? Running requires the ability of muscles to work together in 3 biomechanical planes. When these 3 planes are functional, the runner has the ability to turn muscles "on" and "off" allowing for reciprocal alternating activity to occur in the back, pelvis and hips. If control is lost in just one plane; compensation, fatigue, strain and injuries occur. Learn the signs and symptoms of lost tri-planar activity to prevent injuries. Learn how to run faster... by 1st learning how to slow down. Learn how to breathe better by repositioning your diaphragm before you run. 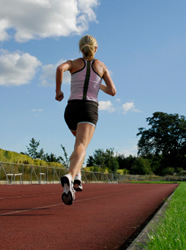 Learn the mechanics of proper arm swing and stride to make you a better runner. Copyright 2019 Spine & Sport Physical Therapy & Aquatics. All Rights Reserved.